The holidays are just around the corner, and you’re probably thinking about sending holiday messages to clients. Whether you’re a job seeker, freelancer, or own your own business, the holidays are a great time to reconnect with your clients as well as reach out to people you’d like to connect with on a professional level. But, before you jot down a quick message and hit send, it’s important to know that there are some do’s and don’t’s of sending holiday messages to clients. Because the thing is, your clients are probably already being bombarded with holiday messages from a number of other businesses. You need to do something to make your message stand out. Yet, you don’t want to sound overly sales-y or overly cheesy and have your message end up in the spam folder. After all, the holidays are a time for relaxing and cheer. It’s a fine line businesses have to walk, as too much or too little communication can negatively impact your brand. In this article, we’ll go over the top do’s and don’t’s of sending holiday messages to clients this season. Asking yourself why you’re are sending holiday messages to clients is a good first step in figuring out how to formulate your greeting. There’s nothing worse than receiving a greeting that was clearly given minimal effort. So ask yourself, what are the reasons behind sending this holiday greeting? What can you accomplish from it? Would you like to get in touch with clients you’d like to work with more? Would you like to touch base with clients you talk to regularly? Or, would you like to send a note to a client you really enjoyed working with? Asking yourself the purpose of your holiday messages will help you better figure out what to say to your clients. It’s pretty amazing how many companies forget to take a second to make sure their contact information is up to date before sending out their messages. No matter how many messages you plan on sending out, it’s vital to double check that your contact information is correct, everything is spelled correctly, and that you’re not sending any duplicate messages. These mistakes can make your business look unprofessional and can even cause confusion when clients try to reach out to you again. Remember, your holiday messages to clients are different from the holiday messages you send to friends. Therefore, it’s important to remember that you need to keep your card professional. While it may seem funny to send out a photo of you and your coworkers doing shots, some may find this offensive. It’s better to err on the side of overly professional than it is to go for a joke that might miss the mark. While holiday cheer is certainly contagious, it’s important to remember that not everyone celebrates Christmas. Unless you are a faith-based organization, it’s generally best to assume nothing when it comes to the religious and cultural traditions of your clients. In our politically correct society, this is a good way to make sure your holiday messages to clients don’t unintentionally offend anyone. On the flip side, if you have clients who you know for sure celebrate Hanukkah, wishing them a happy Hanukkah is a great idea. They’ll appreciate the fact that you remembered this personal detail about them. Don’t treat your holiday card sending the way you treat your Christmas gift shopping. In other words, don’t wait until the night before Christmas to send out your messages. In general, anytime shortly after Thanksgiving is a good time to send holiday messages to clients. But, if you miss the deadline, don’t sweat it too much. You can opt for sending out New Year’s greetings instead. Just make sure that regardless of when you choose to send, you give yourself enough time to craft a quality, meaningful message. Even though it’s a good idea to add a personal touch to your holiday cards, keep in mind that the overall message should always be in line with your brand. It’s okay to be generic with your holiday greeting so as not to offend anyone, but make sure insert some personality so your audience remembers you. For example, if your business is known for its lightheartedness and humor, this should be reflected in your holiday message. You may want to display this through a joke, a funny infographic, or a play on words. The holidays are a special time of the year in which peoples’ moods are light and their hopes are high. Let your clients know that you share in these sentiments by writing them a personal note and ending it with your personal signature. And if a personal note to everyone is out of the question, you can instead recount a unique story or share exciting news about the year ahead. And, don’t forget to include something of value with your message, such as a coupon or a giveaway. Just make sure that your valuable item is presented as a gift to them and not as a sales pitch. 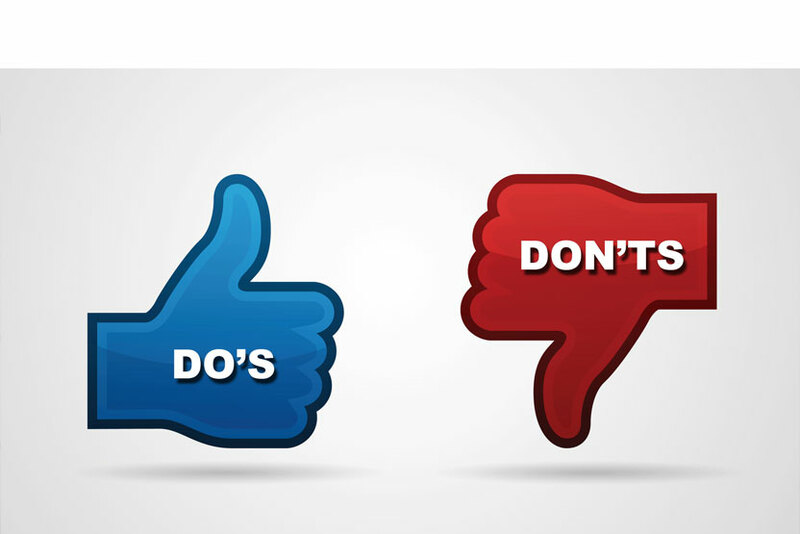 The bottom line with all of these do’s and don’t’s is that, despite your industry and your clientele, your holiday message should come from the heart. Even the best card design won’t hold a candle to a personalized message. So, make sure to take your time crafting your messages and start early so you’re not throwing together a sloppy, half-hearted message the day before. If you’re looking for some inspiration for your cards, be sure to check out our holiday e-card gallery.